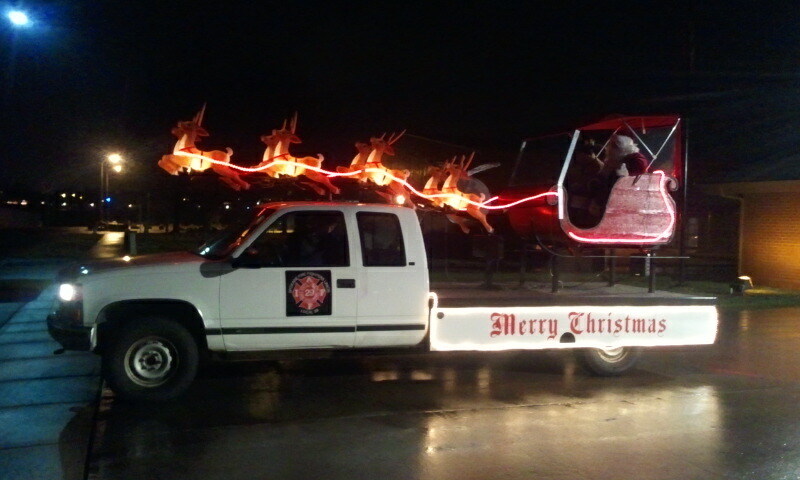 Local 29 Santa Sleigh Flying To Your Neighborhood! Well it’s that time of year again! As I write, the snow is falling, Thanksgiving is firmly behind us, and the Local 29 Firefighters of Spokane are heading out to share some Christmas Cheer! 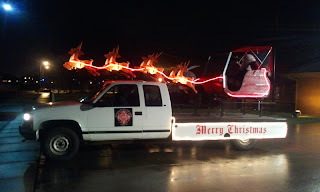 Of course, I am talking about the Local 29 Spokane Firefighters Union’s Santa Sleigh. We are very lucky to have had a wonderful donation of an aging 1998 Chevy service truck (which was due for replacement) from Avista and with a lot of time and money invested on the part of the Local 29 members we have created a brand new Santa Sleigh! They have done a lot of work to get it ready in time for the season. The weather between Thanksgiving and Christmas is always a mystery and now with the four wheel drive sleigh, Santa will be able to get out and about spreading the holiday spirit come freezing rain or snow. In our old sleigh (which we still maintain and use on occasion) we were limited by the two wheel drive under the snowy conditions of December many years. On any given night, a group of Local 29 firefighters check out the sleigh and head out to see as many kids as possible within a given Spokane neighborhood. The music is blaring and candy canes are flying; almost as fast as the smiles! Most crews try and meet by 5:30pm or so and get on the road early enough to see the kiddos before they head off to dreamland. For many kids, the firefighters realize, this is their only chance to see Santa. The malls may be too expensive for many parents or the time required to go may be more than they can offer. It is a very big deal, young or old, to see Santa! And while the teenagers may have learned the secret behind the curtain I can assure you the magic is still very much alive! Parents are overjoyed at a chance to shoot a photo with the kids with Santa! We attempt to stop (when and where safe) and hand out candy canes to every child we see. Many kids and parents may wave from the window at first but if we pause they will frequently grab a coat and head out to visit. So, if you hear a little Christmas music blaring louder than your typical teen driver it just might be Santa Clause and his elves from your City of Spokane Firefighters Union! And don’t forget to be nice, because Santa’s driving around checking on his Naughty and Nice list and you don’t want a lump of coal on Christmas morning do you? News story on trading fire trucks for pick up trucks. Here. Make sure you read the comments. SFD had a call last week for a medical call, got there and it was a fire call. This kind of thing happens a lot. If this call had happened next year, the crew would have had to go back and trade their pickup truck for their engine. In the minutes following, would the person who called have lived? Would her house have burned down? Again, Why do firefighters, all over the world, take a big fire truck on medical calls? It's a very simple answer. And in other places, when citizens ask the question, they get the answer. Congrats to the newly elected and reelected! Don Waller was elected as Local 29 President. Jason Archibald and Shane Skipworth were reelected to eboard. Dan Strobeck and Kasey Austin were elected to Grievance Committee. Congrats to all and thanks for your service! Narrative:At 8:40 PM on Sunday, December 9th, the Spokane Fire Department responded two ladder trucks, four engines, one rescue truck and two battalion chiefs to a reported fire at 607 S. Monroe Street. Engine and Ladder 4 arrived on scene within four and one-half minutes from their Browne’s Addition station and reported smoke from the attic of the three-story Victorian style house, which had been converted to ten apartments. While Engine 4’s crew advanced a fire attack hose to the third floor, Ladder 4’s crew confirmed that all occupants of the structure had evacuated, and then began searching for the source of the smoke. As other crews arrived they were assigned to other necessary tasks including laddering the roof in case roof ventilation was needed, establishing a water supply from a hydrant, extending a backup attack hose and establishing the required rapid intervention team in case firefighter rescue was needed. The smoldering fire in the attic was quickly located, using thermal imaging cameras, and extinguishment was accomplished by opening a portion of the ceiling in one of the third floor apartments. Although crews were able to keep damage to the structure to a minimum, one apartment will not be habitable until repairs to the structure and to the electrical wiring can be completed. Until then, the Red Cross is assisting the occupant of that apartment with temporary housing. During the fire, Spokane Police Officers assisted in routing traffic around the scene, which closed the south Monroe Street hill for several hours. Street Department crews also sanded the hill, due to icing conditions created during firefighting operations. AMR responded an ambulance crew to standby during the fire. Fortunately, there were no injuries to civilians or firefighters. 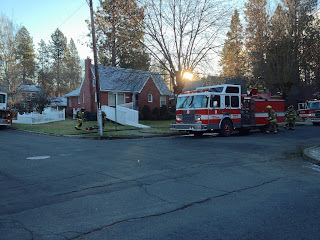 Cause: Investigators from the Spokane Fire Department’s Special Investigation Unit determined the cause of the fire to be malfunctioning electrical wiring in the attic. Damage:Damage was confined to burned ceiling joists and the removed portion of ceiling area. Also, electrical wiring in the fire area will need to be replaced. Engine 9's last fire after a hundred years' service? Too bad E-9's crew was in a spare rig this morning and not their regular engine. 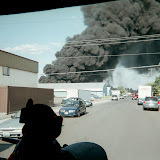 There has been an Engine 9 for over a hundred years serving Spokane's South Hill. Hopefully, the last fire put out by Engine 9's crew, before the city council shuts it down in a couple of weeks, will be in the real Engine 9! How does Spokane's fire service value stack up against its closest comparable? And again, this underscores why firefighters take the big trucks to medical calls. Article about Engine 9 closure. @IAFFLocal29: This morn's @SpokesmanReview article on closure of historical South Hill Engine 9 after years of saving homes & lives here.